Please note: if you've enabled AMP and your blog post has a featured image, it should be at least 1200 pixels wide. There are two-ways to set up AMP for your HubSpot blog. At this time, AMP is not available for HubSpot landing pages or website pages. Select the Google AMP tab. Switch the Enable Google AMP formatted pages toggle on. 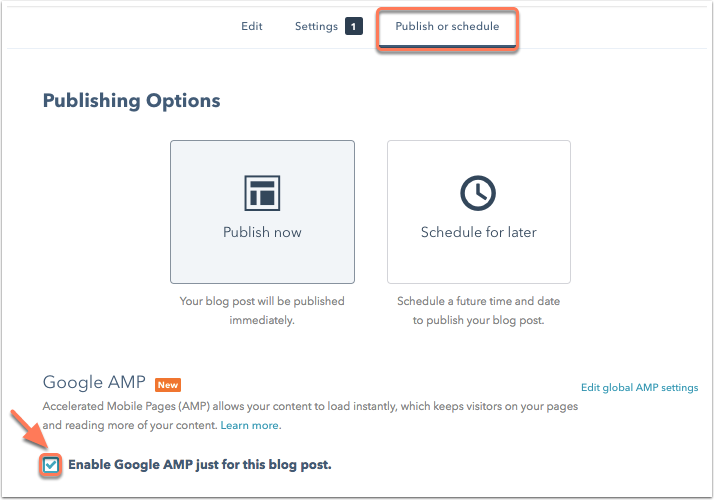 Once AMP is enabled, HubSpot will validate each blog post for your blog template, and the next time Google crawls the blog post they will cache the AMP version. If there are errors with the AMP version, Google will send you an email directly to let you know. Also once AMP is enabled, this Google AMP section will have a number of options that can be customized including logo, font, and font colors. Learn more about Google's recommendations for this content. Once you've finished customizing your AMP settings, click Save. Please note: this option is only available if AMP is not enabled in your blog settings. Hover over the blog post you want to update, then click Edit. Click into the Publish or Schedule tab from that blog post. Within the Google AMP section, select the Enable Google AMP just for this blog post checkbox. Once this is enabled, HubSpot will validate this specific blog post and the next time Google crawls the blog post they will cache the AMP version. If there are errors with the AMP version, Google will send you an email directly to let you know.